Commercial project administrators and business owners have numerous considerations to make when designing an environment for their staff and patrons. 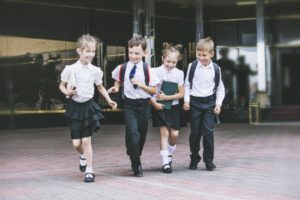 From hospitals to playgrounds, campuses to shopping centres and beyond, paved areas are at constant risk of becoming a liability. The Green Building Council of Australia (GBCA) was established in 2002 as the country’s authority on sustainable buildings, communities and cities. The organisation’s vision is to “create healthy, resilient and positive places for people and the natural environment.” In 2003, the GBCA launched the Green Star – a national, voluntary system for rating sustainable solutions in design and construction. In the busy day-to-day of many schools, there’s often not a lot of priority put on the hardscape surrounding it. After all, hardscapes are nothing more than something to walk on– or are they? So often we see school playgrounds filled with sand, gravel, and rubber mulch. Which are not the safest, most heat-resistant, and most environmentally-friendly options, especially for a hardscape that will mostly be used by children. Here is why schools should be adopting porous pavement instead of “traditional” school hardscape. First and foremost, we think that grip is one of the key elements to hardscapes specifically those that cater to children. Children love to run around, so finding paving solutions that help prevent slipping and falling is important. After all, you can’t prevent children from being children, but you can try to prevent them from hurting themselves. Our Class V porous pavements grip ultra-tight and prevent slips. Finding ways to go green is effective at cutting away at your bottom line, improving your image, and teaching children a valuable lesson on environmental responsibility. Our porous pavement solutions are a great step forward in the realm of green hardscapes. Porous pavement lets water seep through, which avoids drying out the surface below and drains or pools from forming during heavy rain. Porous pavement allows the soil underneath to soak up all of the water, which then spreads to the greenery around. There are many benefits to using StoneSet porous pavement as your hardscape solution. Here is a list of some of the great things that our porous pavement can give you. Customizability: We can make our pavement look any way you want. Want your school logo embedded in the pavement? No problem. Your school colours? No problem. We can customise every detail to your liking. Puddle Proof: StoneSets tiny voids will ensure the rain runs straight through the surface – instead of pooling on top. Long Lasting: We have a 10-year guarantee on our products and a design life of 25 years. You will be using our hardscapes for years to come. Easy-Clean: Cleaning our pavings is super-easy. The school janitor can simply spray them down with a hose. Is there anything easier than that? We think that the time has come for schools to revolutionise their hardscapes. Why use rubber that heats up too quickly, or sand that gets soggy in the rain, or buckshot that hurts feet and gets super hot in the summer? Are you a school looking to get more information on our porous paving and considering making the switch to StoneSet porous pavement? Contact us today.